Now 35% Lighter! Made in USA. Available in 4 color choices: Safari, Leather, Smoke and Natural. 60" and 72" lengths. Order by color and length. Made to order. Minimum 2 week leadtime. For use indoors and outdoors. Artisan Todd Evans crafts each shelf from custom made molds designed to emulate the elegant variations, colors, and imperfections found in natural stone. Perfection Cast Stone is a combination of all natural ingredients (aggregate, cement and iron oxides) resulting in the look and feel of solid stone with comparable strength but without the excessive weight. Thanks to advancements in manufacturing, our Perfection Stone Shelves are now 35% lighter! Textures may vary as each piece is individually crafted and hand poured. Flat and rough surfaces are characteristic of poured cast stone. Overall Height without Corbels: 4" 4"
Overall Height with Corbels: 13" 13"
Weight: 78 lbs. 96 lbs. Because each piece is individually hand crafted and poured, overall measurements may vary up to 1/2" and we recommend that the mantel shelf and corbels be installed first, then install the stone around the shelf. This insures a secure fit for the mantel and brackets. Installation is done following a 3 step plan. It is recommended that 2 people be available for installation. Note: We suggest consulting a local expert if you are unfamiliar with masonry assembly and installation. 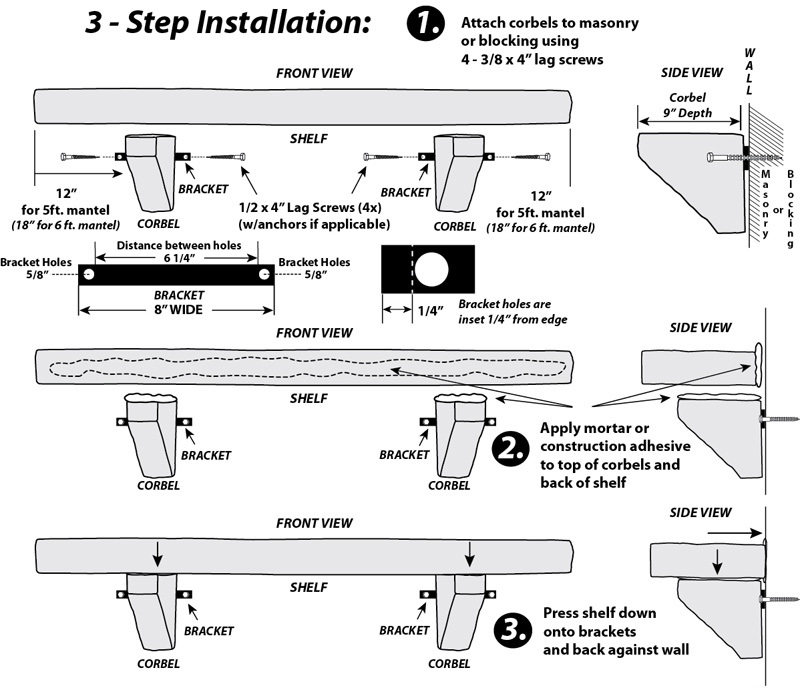 Masonry installation: Install corbels onto the masonry by attaching the brackets with 1/2" x 4" lag screws using suitable anchors. You will need 2 per corbel. For even weight distribution of the shelf, mount corbels approximately 12" in from each end on the 5 ft. shelf and 18" on the 6ft. shelf. 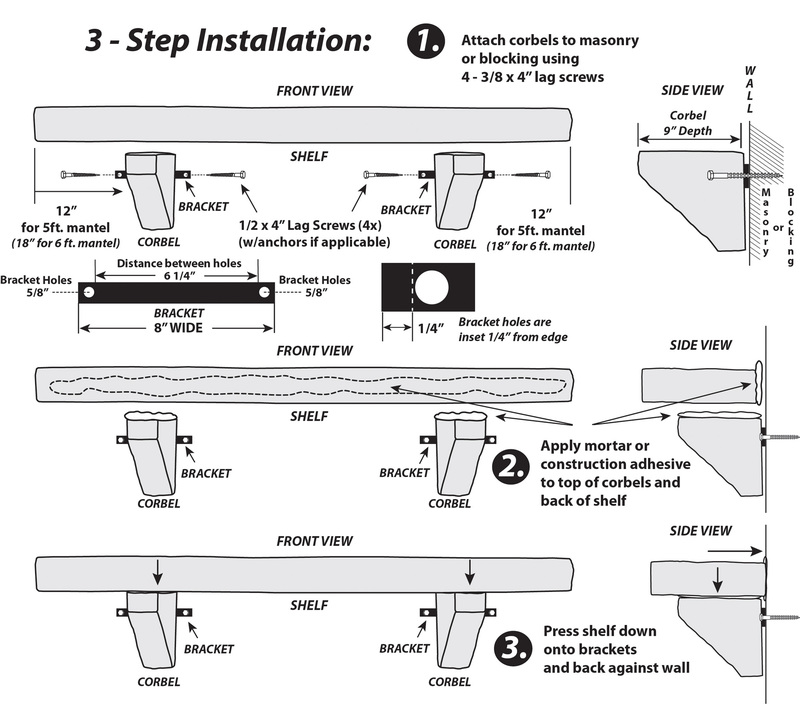 After corbels are installed apply mortar or construction adhesive, per manufacturer's product instructions, to the top of each corbel and to the back of the shelf. Set mantel on top of corbels, arrange so that it is centered on the corbels and press against the wall. If necessary, clean with a slightly dampened cloth. Commercial cleaning products are not recommended. If this is new construction, the stone will go over the brackets keeping them out of sight. If this is a retrofit, use any stone parts that were chipped out in order for the shelf to fit to hide the brackets. Because each piece is individually hand crafted and poured, overall measurements may vary up to 1/2" and we recommend that the mantel shelf and corbels be installed first, then install the stone around the shelf. This insures a secure fit for the mantel and brackets. If there are any gaps, they should be filled with mortar joint. Please consult a professional if necessary.